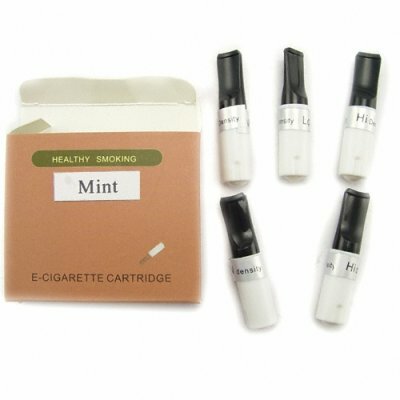 Successfully Added E-Cigarette Refill Pack w/5 Mint Cartridges (for CVSMR-201) to your Shopping Cart. E-Cigarette refill pack w/5 mint flavor cartridges for the CVSMR-201 electronic cigarette. E-Cigarette refill pack with 5 carcinogenic free cartridges for the best selling model CVSMR-201 E-Cigarette anti-smoking nicotine replacement unit. If you are still finding it difficult to kick the habit after using this therapy, but really do not want to go back to smoking cigarettes again, we are very happy to offer you this refill pack. It comes with 5 cartridges containing high, medium, low, and no nicotine levels to help you gradually reduce your smoking habit. A perfect product for our partners who are ready to offer their customers a healthy high-tech smoking alternative, or anyone who needs to source additional cartridges for their existing E-Cigarette. We are offering these nicotine refills at a quantity of at least 5 packs in order to give you the absolute best advantage from our low wholesale price and even better shipping rates. With a required order of 5 refill packs the total number of refill cartridges would be 25 (5 cartridges x 5 packs = 25 cartridges total). E-Cigarette Refill Pack with 20 mint flavored cartridges. Provide gradual amounts of nicotine to help you kick the smoking habit effectively. As per customer requests we lowered the box order quantity from 25 boxes to only 5 boxes. Thank you for your valued comments and feedback that help to make us the number one rated choice for sourcing wholesale electronic devices! on 2009-02-05 03:45:28 Good ! It's good product , nice smoke and flavour !